My name is Evgenia Gudkovskaja, I live in St.-Petersburg (Russia). 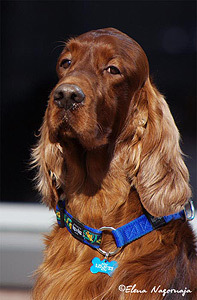 My heart is forever given to the breed of Irish setter. The first Irish appeared in my house in 1991 and lived with us during happy 14 years. For 7 years I was the chief of this breed in the Petersburg club "Hunting with hounds". 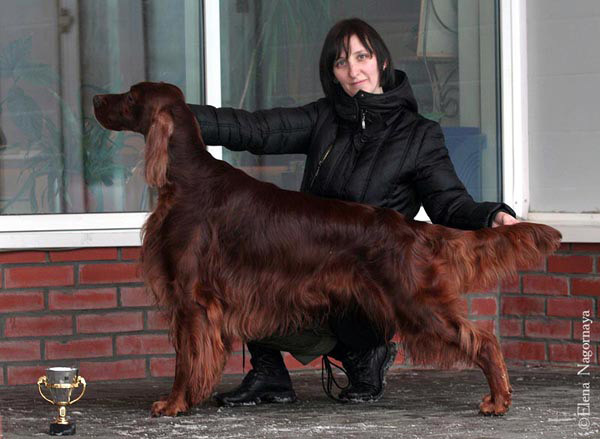 At present I have the Irish setter from Hungarian kennel Garden Star's - Garden Star's Irish-King, at home - King, very tender, friendly, a little bit frolic and a very loveful dog. This site is devoted to him. JCAC and JCH Belarus, BOB, BIG-1, Best Junior In Show-I and BEST IN SHOW-I!!! My congratulations for Oksana Ulanovska, Natasha (owner of Nigel) and Adel (handler)! Good job!!! King and his children were perfectly exposed! King became the Best Dog, the Winner of Club and the BOB! News on King's page Show >>> (result and photo).